Sustainable Energy author Ireland (SEAI): Are Philips CFL bulbs short lived? Are Philips CFL bulbs short lived? Why are the manufacturers and promoters of cfl bulbs claiming long life on these bulbs? Six years ago I started using these bulbs , I have had to replace many of them in that time , I now put the date of installation on each bulb. Today I replaced 2 Philips genie 8w screw cap bulbs that I fitted on 11/4/09, 1 blew 2 weeks ago & the other blew yesterday. Tom, I have some 22 CFL bulbs currently running in my house. Like you I started to put the date on the base of the bulb with a pencil, so I have a fairly good idea about the lifespan. All CFL bulbs have their lifetime quoted as an "average" number of HOURS. Frequent switching on and off will affect the lifespan, as will any form of dimmer. Regarding Philips CFL bulbs specifically, about 4 years ago I experienced a high rate of failure in some Philips bulbs at that time. I contacted Philips and they were very good about it and sent me a bunch of free bulbs. Now, only occasionally does one blow. My porch light is the most frequent one to blow. This light is switched on during the winter time from maybe 4pm till 9am the following morning. That adds up to 17 hours a day. That bulb lasts about 2 years on average. I am not dissatisfied with this lifespan, which averages out at about 9,000 hours. I would have replaced at least 4 filament bulbs in the same period. You might have got a dud batch, in which case, you should contact Philips. 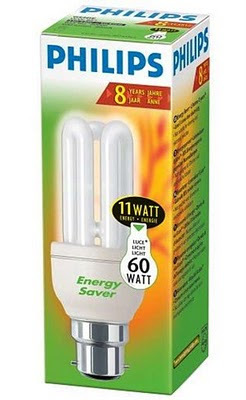 I still think CFL bulbs are terrific value for money and a really great energy saving method. As LED bulbs improve in design and reduce in price, they will eventually overtake CFLs, but that time has not yet arrived. I'm interested to see that Philips replied positively. Right now I have two Philips CFLs in front of me. One is rated at 18W (100W equivalent) and should last for 6 years, assuming usage of 3 hours per day. The other is a 20W (interestingly, also quoted as 100W equivalent) and should last for 12 years at 3 hours per day. Lifespans seem to be increasing. This reminds me that many years ago I worked in a firm that had a dark hallway with an awkward light fitting. The light was left on 24 hours a day & since it was my job to change the bulbs, I installed a Philips CFL. SInce the light was never turned off, I was looking forward to greatly exceeding the quoted lifespan. The bulb failed earlier than expected, so I noted the date on the cap. I also noted the date of the next replacement. To my surprise, the continuous operation did not convey any benefits, indeed the bulbs lasted for almost exactly their stated lives. I was suspicious. I called Philips (Irl) & asked them why their bulbs only lasted for the quoted life (sounds like an odd question!) but the basic answer was "I dunno". I could have taken it futher, but I had other things to do. Interesting, all the same.